The Moon's shadow projected onto the Earth as the eclipse proceeds. The hemisphere of the Earth facing the Sun is shown. Contours show where the Sun's disk is 0% (red), 20%, 40%, 60% and 80% covered. You can download this video in MP4 or OGG format. The Moon will pass in front of the Sun, creating a partial eclipse of the Sun visible from Australia, New Zealand and Antarctica between 20:00 and 01:58 EDT. The alignment between the Sun and Moon will not be very exact, and so the Moon will only partially cover the Sun, and nowhere on Earth will see a total eclipse. From United States, no eclipse will be visible (change location ). The simulation to the right shows the path of the Moon's shadow across the Earth. The red line shows the edge of the Moon's shadow: all places inside the red circle will see the Moon covering some part of the Sun's disk. The yellow contours within this show where the Moon appears to cover 20%, 40%, 60% and 80% of the Sun. The yellow spot in the centre of the Moon's shadow traces out where you would need to be in space to see a total eclipse. Because this is only a partial eclipse, it does not cross the Earth's surface at any point. The map below shows the parts of the world where the eclipse will be visible, which are highlighted within the red contour. The yellow contours show the maximum extent of the eclipse, where the Moon appears to cover 20%, 40%, 60% and 80% of the Sun. Solar eclipses take place when the Earth moves through the Moon's shadow. The dark gray cone behind the Moon indicates the region of space where the Moon appears to completely cover the Sun's disk (the Moon's umbra). The light gray area around it shows where the Moon appears to partially cover the Sun's disk (the Moon's penumbra). 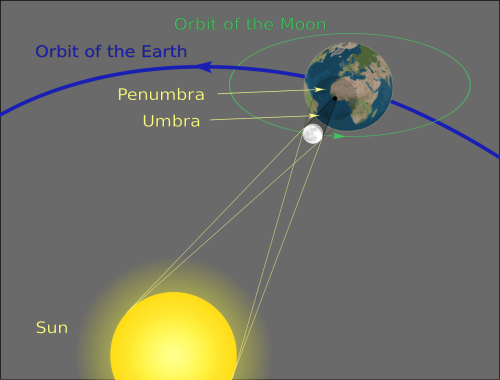 Solar eclipses occur when the Sun, Moon and Earth are aligned in an almost exact straight line, with the Moon in the middle, such that the Moon passes in front of the Sun. The diagram to the right shows this geometry, though for clarity the Moon is drawn much closer to the Earth than it really is. The Moon passes close to the Sun in the sky every month, at new moon, but because the Moon's orbit around the Earth is tipped up by 5° relative to the Earth's orbit around the Sun, the alignment usually isn't exact. In the diagram below, the grid represents the plane of the Earth's orbit around the Sun. As it circles the Earth, the Moon passes through the Earth–Sun plane twice each month, at the points on the left and right labelled as nodes. A solar eclipse results when one of these node crossings happens to coincide with new moon, which happens roughly once every six months. At other times, the Moon typically passes a few degrees to the side of the Sun at new moon. Even when a solar eclipse does occur, it will not be visible from the whole world. The Moon is much smaller than the Earth, and so the shadow that it casts onto the Earth is never more than a few hundred miles across. As the Moon moves relative to us, the shadow sweeps across the Earth, so that different places see the eclipse at different times. The Moon's orbit is tipped up by 5° relative to the Earth's orbit around the Sun, represented by the grid above. New moons only create solar eclipses if they occur when the Moon is close to the Earth–Sun plane, at points called the Moon's nodes. The diagram below shows the Moon's shadow, with the Earth, Moon, and distance between them, drawn precisely to scale. The pink region shows the region of space where the Moon would appear to completely cover the Sun, creating a total solar eclipse. The blue region shows where the Moon would appear to partially cover the Sun, creating a partial solar eclipse. 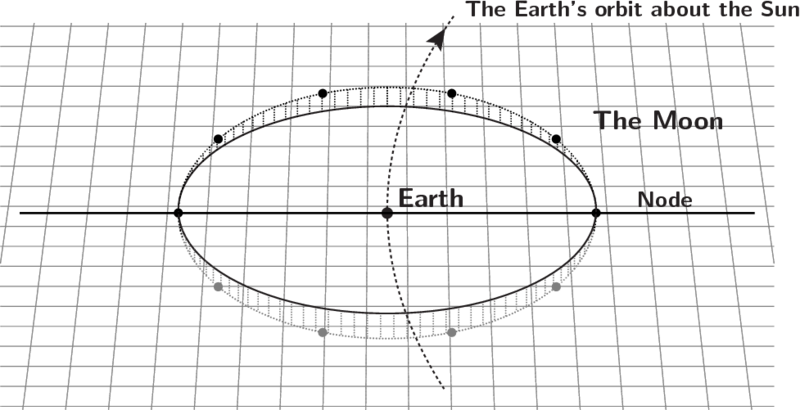 The Earth is drawn twice on the right hand side, once at its closest possible distance from the Moon (left), and then again at its furthest possible distance from the Moon (right). The cross marks the maximum distance from Moon at which a total eclipse is possible. Beyond this, the Moon appears too small to entirely cover the Sun. For comparison, the geometry of lunar eclipses is also shown below: the Earth's shadow is by contrast to the Moon's shadow, amply large enough to cover the whole Moon at once, as happens in a total lunar eclipse. A simulation of how the eclipse will appear from Cambridge. The chart to the right simulates how the eclipse will appear from Cambridge between 20:01 and 02:01 EDT. The yellow disk represents the Sun, while the black disk represents the Moon. No eclipse is visible from Cambridge, and so the Moon never quite passes in front of the Sun. Below, the path of the Moon's shadow is projected onto a flat map of the world. As above, the red contour shows the edge of the Moon's shadow, and encloses everywhere where the eclipse can be seen. The yellow contours show where the Sun is 20%, 40%, 60% and 80% covered. Observing the Sun can be very dangerous if it is not done with the right equipment. The Sun is the brightest object in the sky, and looking directly at it can cause permanent eye damage within seconds. Viewing it through any optical instrument – even a pair of binoculars or the finderscope on the side of your telescope – can cause instant and permanent blindness. If you have any doubts about whether your equipment is safe, it is best not to risk using it. By far the safest thing to do is to go along to a public observing event. Many astronomical societies are likely to be hosting observing events on the day, and they'll be sure to welcome newcomers. You may meet some new people at the same time as seeing the transit. Many astronomy suppliers sell special special filters which are made for safe solar viewing. These include aluminised mylar filters, or black polymer filters, identified as suitable for direct viewing of the Sun. Check that the filter has a CE mark, and a statement that it conforms to European Community Directive 89/686/EEC. Alternatively, you can use a welder's glass rated at No. 14 or higher. Always read the manufacturer's instructions carefully. Never attempt to make your own filter. In addition to visible light, the Sun also produces prodigious amounts of infrared and ultraviolet radiation which cannot be seen yet can still damage your eye. Even if a homebrew filter appears adequate, it may allow this unseen radiation to pass. Two example of low-cost cardboard solar projection boxes. These two are sold in the UK by Green Witch. Another safe way to view solar eclipses is to buy a purpose-built solar projection box. These typically consist of a cardboard box with a small lens on one side. They project an enlarged image of the Sun onto a white cardboard sheet inside the box. Once the transit is over, they're also great for observing sunspots. They are safe to use, quick to set up, and ideal for use with children and groups. Sun (centre) 07h28m +21°52' Gemini 31'27"
The simulations above were derived from the DE405 ephemeris published by the Jet Propulsion Laboratory (JPL). The position of the Moon's shadow is superimposed on maps of the world taken from the NASA Visible Earth project. The list of countries from which the eclipse is visible was computed on the basis of shape files available from DIVA-GIS. You may embed the animations and images above in your own website. They are licensed under the Creative Commons Attribution 3.0 Unported license, which allows you to copy and/or modify them, so long as you credit In-The-Sky.org. © Jerry Kickhart, Los Osos, California.